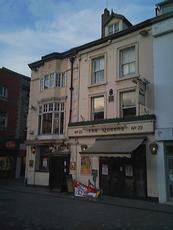 Actually, I think there's another 4 bookies within spitting distance of this old gem of a pub! I used to work in the Queens, and I miss working there. It was a special pub. The staff and the customers, especially the locals made it what it was..
Oh dear - I walked past here last week and saw that the hoardings had been taken away and it had re-opened. I got all excited and thought "what have they done to this pub". I got closer and then realised they had converted it into a Paddy Power bookmakers! Just what we need - another bookies within walking distance of 2 others on the same street! Has been closed now for over a month. Hoardings have been up around the building but not sure what they are doing. Nothing special about this place, it's just a run of the mill city centre pub. Interior is always clean and the bar staff are friendly. No real ales but John Smiths is cheap at �1.89. A mix of locals, shoppers and tourists come here and it's always got a good flow of customers due to it's location in the main shopping area of the city centre. The Queens is a good place to meet up with friends before moving on to the Dale Street crawl, or to have a swift pint after work or a busy afternoon trawling through the shops. Get a window seat on the first floor which overlooks Williamson Square, the Playhouse Theatre and St Johns Beacon and just watch the world go buy.